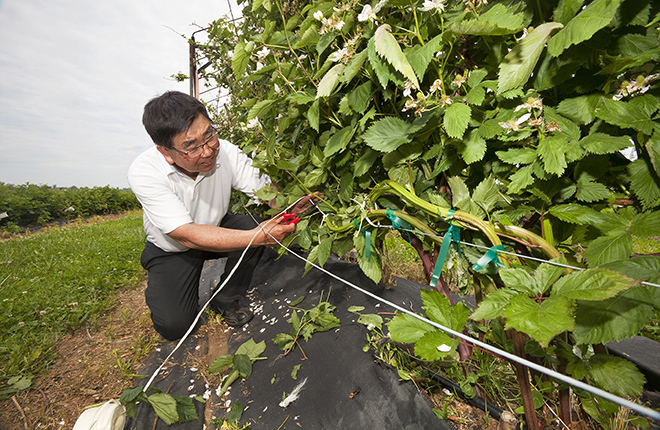 ARS horticulturist Fumiomi Takeda ties blackberry canes to training wire to keep the canes growing horizontally, a vital step in the new rotating cross-arm trellis and cane-training system. (Stephen Ausmus, D3464-4). At the Appalachian Fruit Research Station in Kearneysville, West Virginia, ARS horticulturist Fumiomi Takeda developed a rotating cross-arm trellis and cane-training system for blackberry plants to help growers overcome environmental challenges. Here, Takeda (right) inspects blackberry plants on the new trellis system while technician N. Wade Snyder inspects blackberry plants trained using a conventional system. (Stephen Ausmus, D3461-4). Blackberry crops are becoming more common in the United States, but commercial production is limited in the Midwest and Northeast because the plant’s canes (branches) are injured or killed by low temperatures. In the southern parts of the country, the challenges are high temperatures and intense sunlight, which can cause fruit to sunburn. Agricultural Research Service horticulturist Fumiomi Takeda of the Appalachian Fruit Research Station developed a rotating cross-arm (RCA) trellis and cane-training system to help growers overcome environmental challenges, produce more fruit, and reduce labor costs. This system can increase a grower’s income by more than $6,000 per acre—a significant increase. The system consists of a fixed length of fence and an equal length of fence fitted to the top with hinges, allowing it to be set at different positions. “The RCA system allows the canopy [top part] of the blackberry plant to be rotated so that the canopy can be positioned horizontally, diagonally, or vertically,” says Takeda. “In this system, when the primocanes, or first-year growth, reach a certain length, they are bent and trained to grow horizontally on the wire to the adjacent plant, at which time the tips are cut. The lateral canes that develop from the primocanes are trained on wires on the long cross arm. Once the lateral canes are tied to the wires, the plant canopy can be rotated without breaking the canes to lower the plant canopy closer to the ground in winter and raise it to the diagonal in spring,” says Takeda. Blackberry canes have a 2-year life cycle. “First-year growth is strictly vegetative and then the canes must survive the winter. The overwintered canes, called ‘floricanes,’ are reproductive and produce fruit from the second year onward,” explains Takeda. 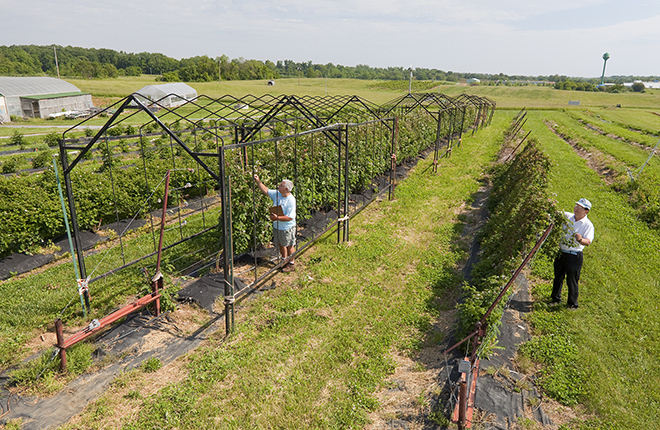 The fruit of conventionally trellised blackberry plants is harvested from both sides of the plant row and in the middle of the wide plant canopy. Harvesting fruit on one side of the row of plants trained to the RCA trellis was 30 percent faster than harvesting fruit from both sides of the row. To limit damage from harsh winter temperatures, growers can use the new trellis system to reposition the canopy and protect it. In the southern portion of the country, high temperatures and intense sunlight can cause fruit to burn. With the RCA trellis and cane-training system, the fruit can be positioned away from direct sunlight. “In Georgia, the adoption of the RCA trellis and cane-training system has reduced sunburn damage in the Apache blackberry from about 35 percent in the conventional system to less than 5 percent. It has helped increase the volume of fruit that can be packed and can reduce harvest costs, which resulted in increases in grower income,” says Takeda.—By Sharon Durham, Agricultural Research Service Information Staff. “Blackberry Trellis System Boosts Profits” was published in the August 2015 issue of AgResearch Magazine. New trellis system developed by ARS for blackberry production. Trellis can rotate the plant canopy to optimize growth, minimize winter damage. System now manufactured by a company in Indiana. Increases profits by more than $6,000 per acre for growers in the Midwest.